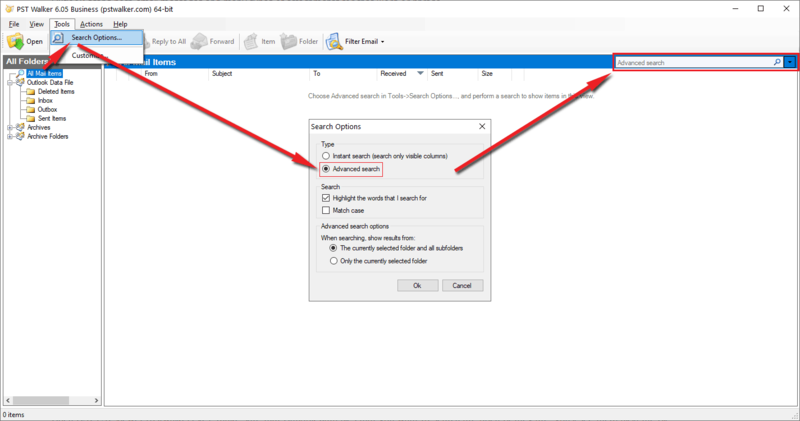 This article explains how to search multiple .pst files without Outlook at once. Any .pst file (archive, password protected or encrypted) can be searched together with any others. This means that if you're searching for a sensitive email, private contact or calendar item, but you're not certain which file or account you put it in, you'll be able to find it easily with a single search. How? Make sure that the data files that you want to search are open (if they are, you'll see them in the All Folders Pane). Select All Mail Items as the location for your search, choose Advanced search option and then type the search criteria that you want to search. Review highlighted keywords so you don't need to looking for the search criteria. Pinpoint searching using the familiar boolean operators (&, |, !, ?, *). Note If you have many .pst files open, or if you have a few really large .pst files open, it may take a while to search for messages.